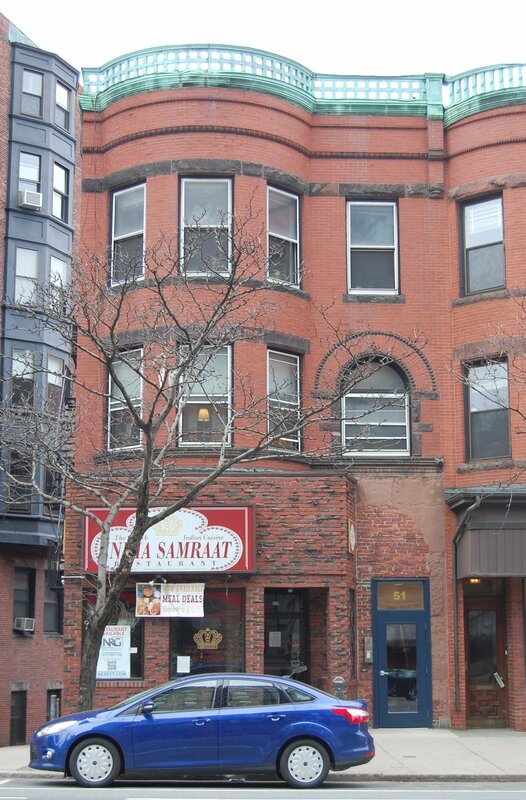 Irregular Lot: 22.93′ on Massachusetts Avenue (1,495 sf). 51 Massachusetts Avenue is located on the west side of Massachusetts Avenue, between Marlborough and Commonwealth, with 49 Massachusetts to the north and 371 Commonwealth (61 Massachusetts Avenue) to the south, across Alley 905. 51 Marlborough was designed by architect Samuel D. Kelley and built in 1889 by Warren Dexter Vinal, a builder and real estate developer, one of four contiguous houses (424 Marlborough and 47-49-51 Massachusetts Avenue). He is shown as the owner on the original building permit applications, all dated March 1, 1889, and on the final building inspection report, dated November 15, 1889. On the application for 51 Massachusetts Avenue, the address is shown as 440 West Chester Park; it changed to 51 Massachusetts Avenue when West Chester Park was renamed on March 1, 1894. 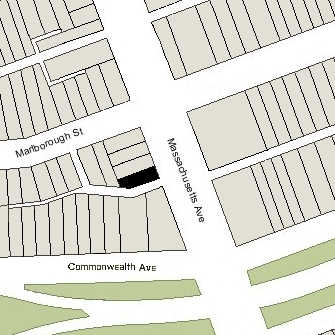 The land for 424 Marlborough and 47-49-51 Massachusetts Avenue was purchased on February 7, 1889, by Warren Vinal’s wife, Ada A. (Fauteux) Vinal, from Henry Lee, H. Hollis Hunnewell, and Augustus Lowell. It was part of a larger parcel that Henry Lee and his partners purchased on February 20, 1883, from a real estate investment trust formed by Grenville T. W. Braman, Henry D. Hyde, and Frank W. Andrews. The parcel was one several tracts of land the trust had purchased from the Boston Water Power Company on March 1, 1872. Click here for an index to the deeds for 51 Massachusetts Avenue, and click here for further information on the land west of Massachusetts Avenue between the south side of Beacon and the north side of Commonwealth. On May 8, 1889, Ada Vinal transferred the land and the buildings (which probably were under construction) to her husband. He then sold the completed houses to individual buyers. 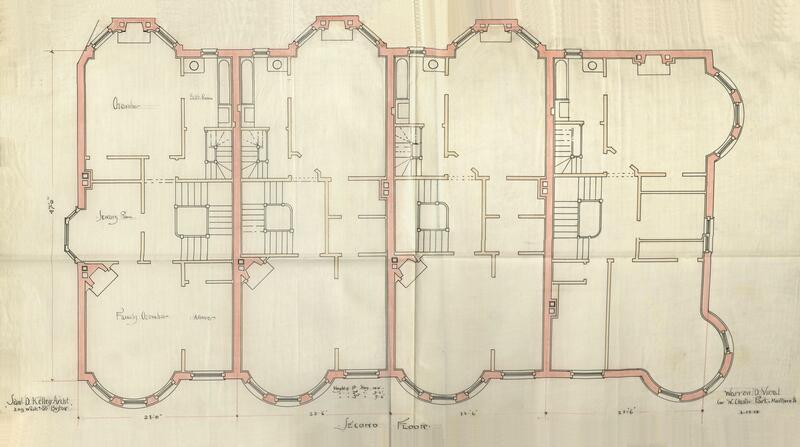 In the deeds for 47-49-51 Massachusetts Avenue he included a 3.5 foot wide easement across the rear of 49-51 Massachusetts Avenue to provide passage and drainage for all three houses to the alley. 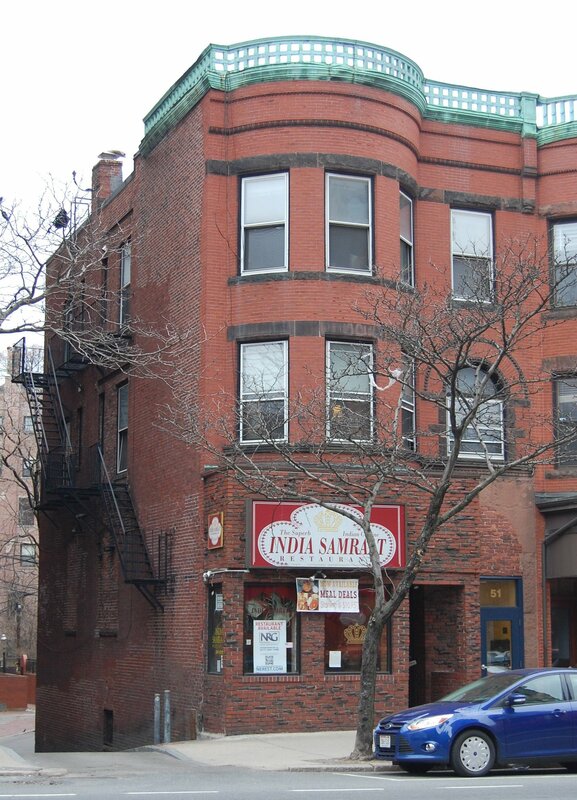 On April 1, 1890, 51 Massachusetts Avenue was purchased from Warren Vinal by George Oliver Carpenter, a paint and varnish manufacturer and general insurance agent. He and his wife, Maria Josephine (Emerson) Carpenter, lived at 10 Union Park in 1889 and before, and at the Hotel Kensington (687 Boylston) in 1890 and later. During the 1890-1891 winter season, 51 Massachusetts Avenue was the home of the Carpenters’ son and daughter-in-law, Frederick Banker Carpenter and Alice (Beebe) Carpenter. Their primary residence was in Wakefield. The house was not listed in the 1892 Blue Book. On December 1, 1891, 51 Massachusetts Avenue was purchased from George Carpenter by Anita Damon (Lyon) Forster, the wife of Dr. Edward J. Forster. They previously had lived at 22 Monument Square in Charlestown. Edward Forster was a physician and had been appointed earlier that year as chief of the medical department of the Massachusetts State Militia. He died in May of 1896 on board the steamboat Puritan, at dock in New York City, returning from a conference of military surgeons in Philadelphia. Anita Forster moved soon thereafter. On October 1, 1896, 51 Massachusetts Avenue was purchased from Anita Forster by Dr. Albert Novatus Blodgett. He was a physician and also served as superintendent of the Massachusetts Eye and Ear Infirmary. He was unmarried and maintained his home and office at 51 Massachusetts. He previously had lived and lived and maintained his office at 390 Boylston. Dr. Daniel Lawrence Hunt, also a physician, maintained his office at 51 Massachusetts with Dr. Blodgett. He lived at 171 Walnut and then at 5 Mountfort. He married in November of 1898 to Ruth Hancock; after their marriage, they lived in an apartment at 293 Commonwealth where he also moved his office. In about 1899, Dr. John Hammond Blodgett joined Albert Blodgett at 51 Massachusetts. He is shown in the 1900, 1910, and 1920 US Censuses as Albert Blodgett’s son, and is also referred to as such in Albert Blodgett’s Boston Globe obituary, published on July 10, 1923. In his passport application dated May 7, 1911, however, John Blodgett states that his father is deceased, and it may be that he was Albert Blodgett’s adopted son. John Blodgett was an ear, nose, and throat specialist, and maintained his medical office at 551 Boylston. He previously had lived and maintained his office at 148 Chandler. He continued to maintain his office at 551 Boylston until about 1910, when he moved it to the Hotel Puritan at 390 Commonwealth. By 1910, and possibly before, 51 Massachusetts Avenue also was the home of Miss Anna Charlotte Hanson, who was the Blodgetts’ housekeeper. Albert Blodgett died in July of 1923 and on April 22, 1925, the trustees under his will transferred 51 Massachusetts Avenue to John Blodgett. He continued to live at 51 Massachusetts Avenue during the 1923-1924 winter season, but moved soon thereafter to an apartment at 7 Exeter and then to 20 Hereford. Anna Hanson moved to 7 Exeter and then to 20 Hereford at the same time. 51 Massachusetts Avenue no longer was listed in the Blue Books after 1924. John Blodgett died in July of 1926. In his will, he named Anna Hanson his heir and executrix. On July 2, 1926, 51 Massachusetts Avenue was purchased from John Blodgett’s estate by Edward Calvin Donnelly. He and his wife, Mary J. (Mahoney) Donnelly, lived at 63 Commonwealth. Edward Donnelly was president of John Donnelly & Sons, a major outdoor advertising (billboard) company. By the late 1920s, 51 Massachusetts Avenue had been converted into offices and one or more apartments. Edward Donnelly died in January of 1927. 51 Massachusetts Avenue continued to be owned by a trust established under his will. In March of 1937, Mary Donnelly, as trustee under his will, applied for (and subsequently received) permission to change the occupancy from a single-family dwelling (with “lodgings” crossed-off from the applications) to four apartments and a store. By 1942, the storefront at 51 Massachusetts Avenue was leased by First National Stores, which previously had been located at 57 Massachusetts Avenue. It remained there until about 1944, but by 1945 the Commonwealth Food Market, operated by Maurice M. Schwartz, had moved there from 47 Massachusetts Avenue. It remained there until late 1968 when, according to a November 25, 1968, Boston Globe column by Bud Collins, it was forced to close as a result of a combination of competition from large supermarkets and rent increases. On May 11, 1948, 51 Marlborough was acquired from the trust established under Edward Donnelly’s will by Domenic Salvati and his wife, Genesia (DeBernardi) Salvati. They owned 424 Marlborough, where they lived and operated the Marlboro Market. Genesia Salvati died in November of 1960 and Domenic Salvati died June of 1961. 51 Massachusetts Avenue was inherited by their son, Vincent P. Salvati. In about 1969, the storefront at 51 Massachusetts Avenue became Dino’s Pizzeria Restaurant, operated by Frank Strosco. On November 16, 1976, 51 Marlborough was purchased from Vincent Salvati by Frank Stroscio, Carmen Stroscio, and Anthony J. Stroscio. Dino’s Pizzeria continued to operate there and, in April of 1977, Frank Stroscio filed for (and subsequently received) permission to convert the property from four apartments and a store into four apartments and a restaurant, legalizing the current use. Dino’s Pizzeria remained there until about 1989, when it was replaced by the India Samraat restaurant. On December 28, 1984, the Stroscios transferred the property to themselves as trustees of the F. T. C. Realty Trust. 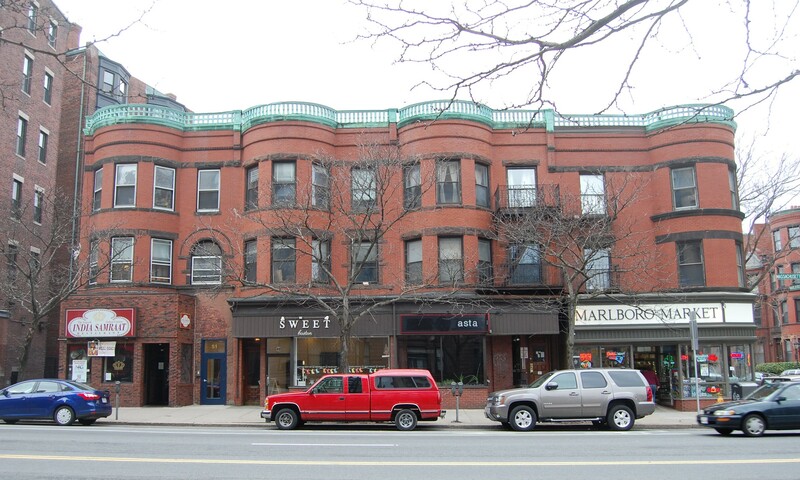 On November 16, 2012, 51 Massachusetts Avenue was purchased from the Stroscios by James F. Keliher, trustee of the 51 Mass Ave Realty Trust. 51 Massachusetts Avenue continued to be a residential and commercial building in 2018.